See two related videos by searching for parishinvestments at youtube.com. The first video is titled “Clinton Tax Scheme” and the second is titled “Missing Clinton Financial Disclosure.” The purpose of this comment is not to disparage the Clinton’s but rather draw attention to the most astonishing tax loophole in 25 years. Question 1) Did former Bill Clinton receive, or should he have received, either a 1099 or W-2 from the partnership with Ron Burkle. This is important because it will reveal weather he was a consultant, employee or passive investor. Bloomberg reported that the partnership has paid Clinton more than $15 million since 2003 and, based upon quotes from the Clinton’s in the press, it does seem clear that at least part of this amount was consulting fees or wages. Question 2) What have been the total cash and property related distributions from the partnership to the Clinton’s since 2003? This is important because only earnings and profits are taxable when distributions are made to partners. Other distributions of partnership assets such as cash or property are not taxable and never hit the tax return. The youtube video titled “Clinton Tax Scheme” explains how this can work. Question 3) What is the Clinton’s current investment basis in the partnership? This is important since parters can often forego property distributions in lieu of increasing their basis, ownership interest, in the partnership. For example, if partners decide to distribute excess non-taxable cash from various businesses owned to partners, one partner could opt to not take the non-taxable cash distribution and instead increase their investment basis or stake in the partnership. My analysis indicates this amount could be somewhere between $10 and $150 million. It is most surprising that Senator Clinton has gotten this far without disclosing these key facts. Perhaps it is also indicative of the medias lack of understanding of basic partnerships. The following are a few partnership basics summarized right from the tax code. Again, do visit youtube and search for “Clinton Tax Scheme” to see how this works. 1) Two types of partners exist, general and limited. General partners, like the Clinton’s, get a share of all key benefits and responsibilities related to the partnership. Benefits include earnings and profits and responsibilities include a share of debt incurred. These are flexible arrangements that can be modified at any time with all partner’s content. For example, one partner gets all the depreciation deductions in lieu of the other getting a larger percent of earnings and profits. 2) Earnings and profits are not the same as cash flow in that only earnings and profits generate a taxable dividend to partners. For example, if the partnership takes out an insurance policy on a key partner, those proceeds or cash flow can then be distributed tax free to the remaining partners. The reason is that these proceeds are not “earnings and profits” but rather distributions of partnership property. 3) The word “basis” has two meanings, one per the IRS and another per the equity in the partnership. Tax basis per the IRS simply recognizes how much an investor has at risk for purposes of calculating the taxable gain once the investment is sold. Partnership basis, on the other hand, recognizes how much each partner has invested in the partnership for purposes of allocating assets when the partnership is dissolved or wound down. This partnership basis is not taxable since not a taxable dividend but rather a distribution of partnership property. 4) What triggers the recognition of taxable dividends to partners is earnings and profits, as determined by the IRS. Simply put, if there are no earnings and profits, there are no taxable dividends. Put another way, if the partnership generates cash that is not earnings and profits, that cash can be distributed tax free to general partners. It is common for private equity firms to borrow money in their various companies names and then distribute the debt proceeds to partners rather than reinvest in the business. The smart decision for the Clinton’s in this case would be to forego a cash distribution in lieu of increasing their investment basis in the partnership. 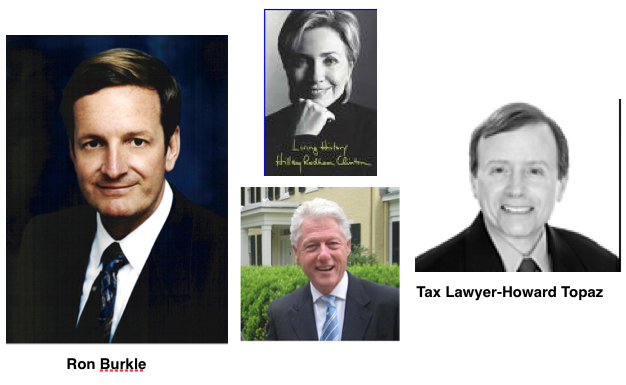 For example, if the Clinton’s invest $1 million with Burkle and later are entitled to $5 million in cash flow that is not distributed to them, their basis or equity interest in the partnership becomes $6 million. My analysis indicates that the Clinton’s investment basis in the Burkle partnership could now be anywhere between $10 and $150 million. Again, there are three very basic questions that the media should ask of Senator Clinton and failure to due so is a great disservice to the American public, both her supporters and detractors. This information based upon original Parish & Company research has been forwarded to Gretchen Morgenson and Floyd Norris of the NY Times.